"Frankie is my brother. He was the most caring, lovable, and respected person I ever knew. He would take the clothes off of his back for anyone. He took care of my mother and myself after our father died. He knew how to have fun, and was so full of life. He was a wonderful son, brother, and friend. Not a day goes by that he is not thought of or mentioned. We miss you so much." 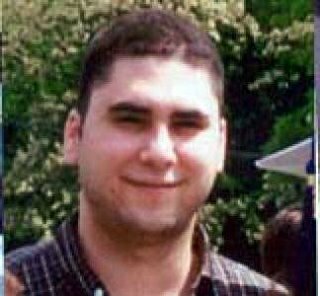 As we commemorate the fifth anniversary of 9/11, it is my great honor to post a remembrance of Frankie Serrano, who was murdered in the World Trade Center attacks on September 11th, 2001 by the filthy-moslem-terrorist-vermin-scum at the tender age of 23. Frankie was a telecommunications technician working near the very top of trade center tower #1 when he was killed. He took pride in the fact that it took him nearly a half hour to get from the ground floor of the WTC up to his office on the 110th floor every day when he came to work. In life, Frankie enjoyed bowling, Ralph Lauren clothes, and his big dog Dino, whom he was always buying toys for and giving his love to. At the time of his death he was living with his mom and sister, as his father had died years earlier. We all remember where we were on that fateful September day when the vermin attacked our country, killing over 3,000 innocent civilians in the name of jihad. No matter how much we may think about it and recall that horrible day as the defining moment that changed our own lives forever (it was on this day that the Mad Zionist was born), we must keep in mind that those who lost loved ones suffer the haunting memories more profoundly than any of us lucky enough to come away from 9/11 personally unscathed. My greatest sympathies go out to the entire Serrano family who lost their beloved Frankie on that fateful, tragic morning so senselessly. His life may have ended that day, but his memory lives on, and it is our duty to see to it that the moslem scum who did this to Frankie, who danced in the streets when Frankie was killed, who celebrated by burning American flags when Frankie was murdered, will taste the fire of merciless justice so that Frankie, and all the other innocents who lost their lives to the vermin on that day, will be avenged.